Recently, Richmond Dental and Medical was featured in Dentistry iQ with a product review by Vanessa Newton, DMD that we are very proud of. Check out what she has to say about our braided cotton rolls! Cotton rolls may seem banal, but what would you say if someone told you there's a cotton roll that won't pop out of the vestibule, stick to the tissue, or get flat and squishy when damp? In this article, Vanessa Newton, DMD, makes a case for braided cotton rolls that have made her life a little easier. I don’t know about you, but I find that retraction can be my best friend or my worst enemy. Sometimes the cotton roll in the vestibule pops out of place and suddenly my field of view is obstructed by the cheek or lips—exactly at the moment when I need to focus on a margin, or when I am packing a cord and trying to stop gingival bleeding. I have always been frustrated by this phenomenon, and I have tried various methods of retraction over the years to see what might work better. I have tried different versions of cotton rolls from different suppliers and companies, and I didn't find any of them to be much different from any other. I use dry angles regularly for maxillary posterior work and have found that they consistently work well for me in that setting. I have begun to use OptraGate retractors (Ivoclar Vivadent Inc.) fairly regularly too, particularly for anterior cases and for cases that are more extensive. When it fits the patient’s mouth well and the patient doesn't have a tight lip, an OptraGate retractor is a great solution for improved visibility. When the patient does have a tight lip, it simply doesn't work. Some patients find them to be comfortable, and others have some level of discomfort. A friend recently gave me some long, braided cotton rolls from Richmond Dental to try, so I could see how I liked them and if I was able to work with them. I have tried the four-inch and six-inch cotton rolls. This was my first experience with a long cotton roll; previously I always stuck to the standard size. 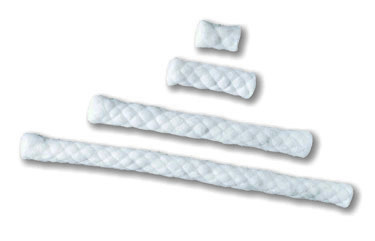 These cotton rolls have a nice braided shape, and they have a good weight and density. They hold the tissue nicely and don’t lose their shape. I have primarily used them with anterior cases, and I have been very impressed with them. Due to the way they are made, they don’t become flat or squishy like the standard cotton rolls. What I found is that once they are damp, they almost work better and become more comfortable for the patient. I have not experienced the types of complaints that I would normally get with standard cotton rolls. Patients seem to find these cotton rolls comfortable when they are placed. I think patients dislike having any form of cotton in their mouths, but this particular cotton roll doesn’t seem to stick to the tissue. According to Richmond Dental, this is because the rolls are made with yarn and not with chemicals. I have not had a single problem with these cotton rolls popping out once I have placed one. 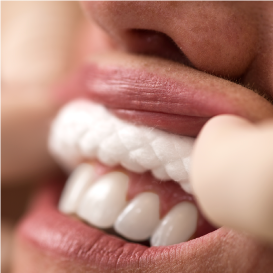 Even if the patient moves their lips or talks a little, the fact that the cotton roll is stabilized on the opposite side of the arch helps to hold it in place. The four-inch length works well in the majority of cases. It nearly reaches around the entire arch without extending too far distally. In a larger mouth, the six-inch length would be fine, although I ended up cutting those a bit a couple of times. Due to the roll staying put, it isn’t necessary to use as much force in holding back the cheek and lip, and this is better all around—for your wrist, your assistant’s wrist, and your patients' happy tissues. I plan to keep these in my daily armamentarium. I believe that these cotton rolls will fill a “role” in my practice for the foreseeable future. I would encourage anyone who, like me, has had some frustration in this area to give these great cotton rolls a try. I don’t think that you will be disappointed. They have the potential to make your life a little easier—who doesn’t like that? I never thought that I would say that a cotton roll could make that kind of a difference! Editor's Note: This article first appeared in Pearls for Your Practice: The Product Navigator. Vanessa Newton, DMD, is a general dentist. She graduated from Tufts University School of Dental Medicine after earning her undergraduate degree from Mount Holyoke College. She spent a year after dental school doing a general practice residency at Montefiore Medical Center in New York. Dr. Newton was a clinical instructor at Tufts from 2005–2012 and has been in private practice since 2005. She is with Wellesley Dental Arts in Wellesley, Massachusetts. Richmond Dental and Medical has received permission to republish this article.